Improves productivity by reducing employee fatigue. Insulates against cold, reduces noise and breakage. 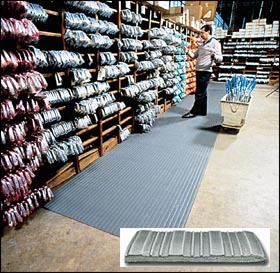 Polyvinylchloride (PVC) closed cell sponge provides a comfortable surface to stand or walk on. Foam construction deflects energy relieving employee fatigue, improving morale and enhancing worker efficiency. All edges are sealed and beveled, reducing tripping hazard and improving safety. 3/8" thick. Available in Gray (GY), Brown (BR), Black (BL), or Black/Yellow (BY) -- please specify. FOB Shipping Point. Product No. Size W x L Thickness Wt. (lbs.) Price Per Linear Ft.
H410C0324 24" x Length (Order by Lin. Ft.)	 3/8"	 .57/sq. ft.
H410C0336 36" x Length (Order by Lin. Ft.)	 3/8"	 .57/sq. ft.
H410C0448 48" x Length (Order by Lin. Ft.)	 3/8"	 .45/sq. ft.
H410C0348 48" x Length (Order by Lin. Ft.)	 3/8"	 .57/sq. ft.